Integra Software Services Pvt. Ltd. (Integra), a leading end-to-end digital content solutions provider, today announced the opening of the Centre of Excellence (COE) for its Digital Solutions Delivery in Chennai, India. The facility, located at Chennai One in Thoraipakkam, will allow Integra to expand its Digital Content Solution offerings to support its global customer base. 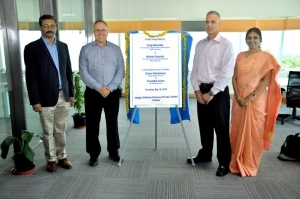 The Centre of Excellence was formally inaugurated by Craig Alexander, SVP of Production & Digital Studio for Global Product and Michael Esposito, VP – Content Sourcing & Vendor Management both from Pearson Education, the global leader in education publishing in the presence of Mr. Sriram Subramanya, Founder, Managing Director & CEO, and Mrs. Anuradha Sriram, Co-founder and Joint Managing Director of Integra. The new CoE facility provides the flexibility of scale to meet the increasing digital solutions demand of its global customers. It has a current capacity of 200 seats, which can be scaled up to 3000 seats and more. This facility will also include the Integra’s Content Innovation Lab (ICIL) which is being built with a strong focus on research, design & innovation in content creation, delivery and analytics with the intent of providing Global leadership in the education technology space. This is a key investment for Integra to drive the next phase of strategic growth initiatives. With an employee strength of 1100+, and many global publishers, and corporate entities as clientele, Integra is an established player in the digital content solutions sector, with 20+ years of experience in the industry. For News Release background on Integra Software Services Pvt. Ltd. click here.